On Thursday night, my theology class was talking about the different views of atonement. In other words, what did Jesus dying on a cross really do for us? Was this a payment to God on behalf of us? Was it a payment to the devil as the ruler of this world for our redemption? Was it an example of complete sacrifice that we should learn from and therefore practice humility? Numerous theologians came up with numerous views. Those views that did not agree with the majority, i.e., the church universal (Catholic) were deemed heretics. 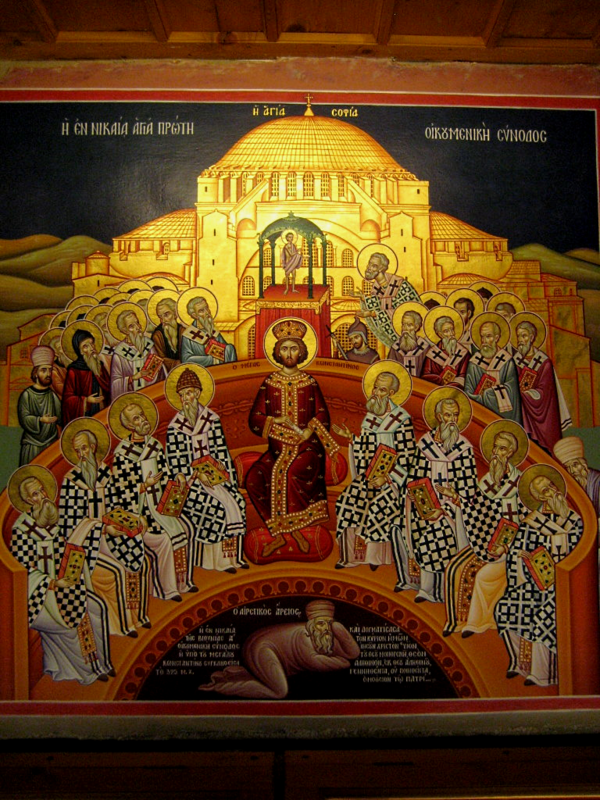 In the above picture, we see one of those “heretics”, Arius. Arius believed that Jesus was not necessarily divine, but he was God’s greatest creation. The church (in the 2nd and 3rd centuries) argued that God and Jesus were of the same substance and that they BOTH existed since the beginning. Arius argued that there was a time that Jesus (the Son, the Logos) did not exist. This got him branded as a heretic by the powers that be. Because there were so many different theologies around, the church made an official statement that they would be the ones to decide what was right and what was wrong. As the church universal (the right and true church) they would dictate what was true about God and what theologies were tolerable. They claimed that through apostolic succession their authority came all the way from Jesus. One would think that such heavy handedness would be long gone by now in a world with so much diversity and so many different voices. Unfortunately, however, we can still see the church (numerous local churches and denominations) claiming that they held the truth and everyone else be damned. A perfect case in point happened during the theology class that I mentioned above. One of the views of atonement was set forth by a man named Socinius. His view was that Jesus was not divine, but rather a prophet that taught love and forgiveness. He believed that Jesus dying and being resurrected was a beautiful example of dedication to God. This view shows Jesus as doing what Micah 6:8 calls for: to do what’s right, to love mercy, and to walk humbly with God. The professor went around the room and chose people at random to see which of the seven theories of atonement that had been introduced the student most adhered to. Luckily (or unluckily) I was not called on. The professor said that “of course” no one would choose the Socinian view because it was just too ridiculous. Well, then, call me ridiculous. Apparently we still live in a time when those of us who do not agree with the main stream are heretics. It makes me wonder what it is they are so afraid of. It seems like a sort of religious xenophobia because God forbid people should believe differently (and even worse!) what if there is some truth to what they believe!? If you Google or check on You Tube for “Emergent church” or “Emerging church” you will find as many rants about how wrong and evil it is as there are actual samples. How can the church be relevant if it does not even acknowledge the changes that are taking place around us? People have given up on the theology that tells us a ruthless God will wipe us out eternally if we do not believe that he killed his son. Ok, I’m admittedly being harsh here, but I think it is time for a worthwhile dialogue between those who claim to hold the keys of truth and those who have moved on. It’s my prayer that this conversation will happen soon and that society can once again see that church is a safe haven where people can be different and seek the Divine in community without worrying about our differences. Rather, we focus on our likeness – that of God and the desire to do right by one another, love mercy, and walk humbly with God. This entry was posted on Saturday, January 28th, 2012 at 11:32 pm	and posted in Uncategorized. You can follow any responses to this entry through the RSS 2.0 feed.